A small, durable green laser sight specially designed to fit subcompact pistols but also works well with various compact and full size handguns. See fitting guide below for specific handgun brands and models. Small size and lightweight that fit with many subcompact and full size handguns. Bright green laser you can see day and night. Dimension: L x W x H = 1.5in.x 1.5in x1.5in. This green laser sight requires an accessory rail. Make sure your gun has an accessory rail before purchase. Subcompact, compact and full size handguns. Subcompact, compact and full size handguns with accessory rails like M&P and SD series. Attention: Earler Smith Wesson S&W Sigma model (SW9VE and SW40VE) requires an adapter. These models have their own proprietary rails that are different from standard accessory rails. Fortunately, adapters can solve this problem. You are welcome to contact us if you need one. SD9VE and SD40VE do not require adapters. All models with accessory rails. While it also fits full size Beretta handguns like 92A1, 92FS, 96, the on/off switch maybe a bit far to reach due to the large space between the rail groove and the trigger guard. Note: some old generation of P22 has a short distance between the rail groove and the trigger guard. Make sure at least 1.1" space between the rail groove and the trigger guard. Fits all pistols with accessory rail, even the small millennium handguns. Note: some full size taurus pistols may have a large space between the rail groove and trigger guard which makes the on/off switch a bit far to reach. While it also fit full size SR9 SR40 SR45 pistols, the on/off switch maybe a bit far to reach due to the large space between the rail groove and the trigger guard. All Glock handguns with accessory rails. The space between rail groove and trigger guard is slightly larger than that of typically pistols so there is a 0.2" gap between the unit and trigger guard. It shouldn't impact usage though. 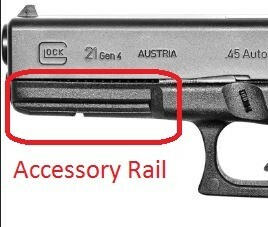 Attention: Some early generation of Glock handguns don't have an accessory rail. This green laser light combo can only be mounted on Glocks with accessory rail. You are welcome to contact us if you have any question. All HK pistols with accessory rails. Attention: Some early generation of Heckler & Koch H&K USP model requires an adapter. These models have their own proprietary rails that are different from standard accessory rails. Fortunately, adapters can solve this problem. You are welcome to contact us if you need one. Make sure your handgun has an accessory rail. Make sure at least 1.1" space between the rail groove and the trigger guard. It won't fit Hi-point brand pistols due to non-standard rails on those models. Contact us if you are still not sure. It was quick to install and sight in with an in the bore laser. Nicely visible in the daylight. The switch is n easy reach of my trigger finger. Thanks, will recommend. original order on line went well, your rep contacted me re upgrade, we exchanged emails without delay and product was shipped without delay. have installed it and works as described. nothing to fault in any part of the transaction. I bought this for my girlfriend's Walther PK380. It was very easy to zero and she loves it. The laser is very easy to see in full daylight.